Forgotten Men is the long overdue account of the significant contribution to the Australian Army of the Australian Army Veterinary Corps in two world wars. One of the army's smallest and least recognized corps, its humble beginnings and quiet work in the background belie the crucial role of the Corps in supporting wartime operations and dealing with logistical issues never envisaged before 1915. While their place in military history is often overlooked, the men of the Australian Veterinary Corps deserve recognition. Stoic and hardworking, they unselfishly worked among the horrors of war, to provide the support needed for army units and their animals. While the Veterinary Corps reached its peak during the Great War, its role did not end when the guns fell silent in 1918. Instead, the Corps continued to support military activities across Australia until horsepower finally gave way to mechanization in World War II. The Corps' success in enabling the 1st Australian Imperial Force to fight in two theaters, each with its own peculiar veterinary problems, is an achievement worth recording. Doctor Michael Tyquin is a consulting historian based in Canberra. He has published extensively in the areas of Australian social, medical and military history. He is a serving member of the Australian Army Reserve which he joined as a medical assistant with the 4/19th Prince of Wales Light Horse. He is the official historian of the Royal Australian Army Medical Corps and is an Adjunct Professor at the University of Queensland’s Centre for Military and Veterans’ Health.Michael Tyquin was born in Melbourne, raised in a farm near Werribee in Victoria. He attended boarding school at St. Patrick’s College, Ballarat, school cadets, joined the Army Reserve in 1982, Mike is still active as an officer in the Royal Australian Army Medical Corps, of which he is the official historian.Mikes interests in animals was obvious at a young age with his proud ownership of his first pony. Both his father and grandfather have bred and used Clydesdale horses. As a young boy he was intrigued by tales and recollections told by family and neighbours of the Light Horse, and waited in vain for similar exploits of the horse, many of which could be seen grazing in the surrounding paddocks, but which never seemed to merit a place in our local folklore.When Mike was researching the history of the Royal Australian Army Medical Corps for its centenary he came across a number of intriguing references to veterinarians and farriers and other men who made up the veterinary corps. 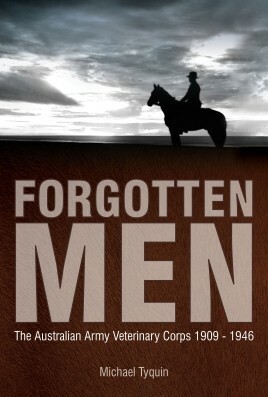 It was then that he made a decision to revisit this group, bringing its story into the light of day and record its contribution to the Australian army - his book Forgotten Men is the long overdue account of the significant contribution to the Australian Army of the Australian Army Veterinary Corps in two world wars.He likes researching history, overseas travel and wind surfing. He is widely published and is currently in the early research phase of a new book on profiteering and fraud in wartime Australia. He is also completing his first historical novel, set in the Boer War. Mike volunteered with Medicin Sans Frontiers to go to East Timor at his own expense during its troubles in 1999, and returned again for six months with the Army in 2008.